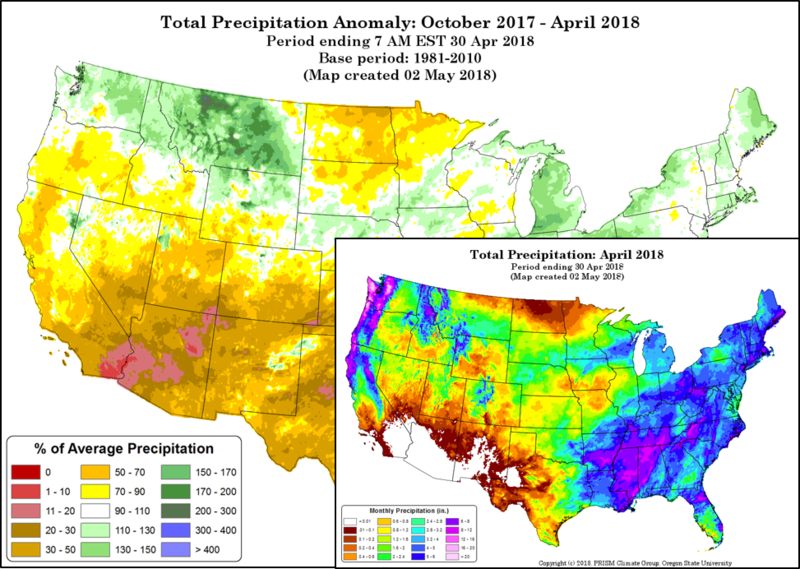 Figure 1: Total precipitation anomaly (large map) and total precipitation (smaller map) during water 2018 (September 2017-April 2018). Images courtesy PRISM Climate Group. A somewhat different viewpoint on the development of drought considers how much precipitation has fallen (or not) AND how much is likely to fall in coming months, based on climatology. 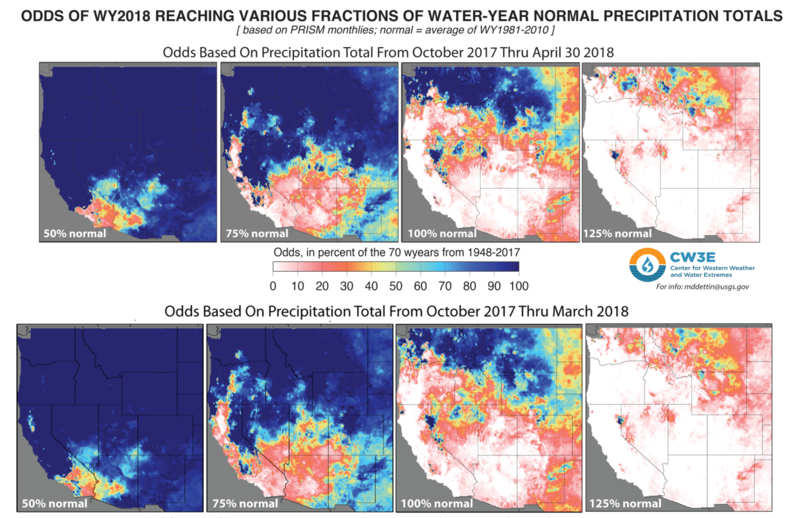 April 2018 produced precipitation over much of northern California and improved odds of reaching normal in some locales, but overall did little to undo the deficits of the previous months in a majority of the state. The following are maps of this year’s drought development that explicitly takes both of these aspects into account. 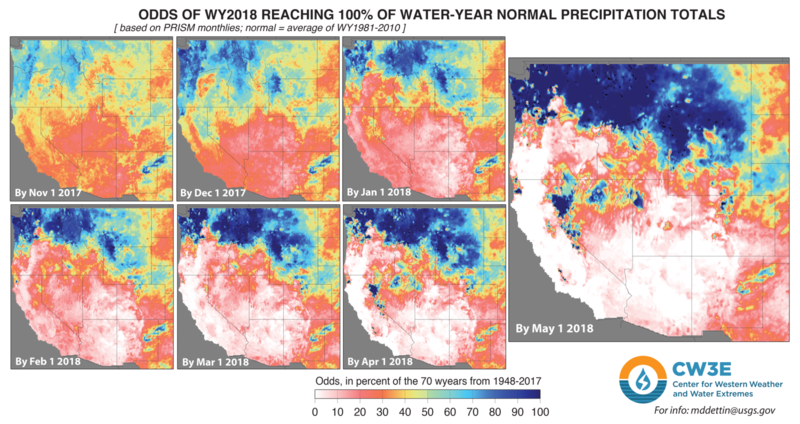 Here is how the drought has evolved so far this water year in terms of the odds of reaching 100% of normal precipitation by end of water-year 2018. Figure 2: Odds of reaching 100% of water-year normal precipitation totals throughout water-year 2018. Drought conditions have continued to develop across the Southwest, as odds of reaching normal have progressively dwindled month by month. Although April was wet over parts of northern California, it was—arguably—too little too late to set us up for reaching 100% of normal this year, in all but a few locales. Figure 3 shows the current odds of reaching various fractions (including but not limited to 100%) of water-year-total this year (top row), as well as the corresponding odds prior to April (bottom row). This approach offers a far different view than the precipitation anomalies of figure 1, emphasizing different “hot spots” of hope & despair. Figure 3: Odds of water-year 2018 reaching various fractions of water year normal precipitation totals based on water year precipitation through April (top row) and prior to April (bottom row). Finally, figure 4 is the “flipped” version of the analysis, asking-at each pixel-how large a water-year total precipitation has a 50% (and other exceedances) chance of being equaled or exceeded this year, as of May 1, 2018. Figure 4: Chance of water-year total precipitation being equaled or exceeded this year.